QualysGuard is a web-based vulnerability management tool provided by Qualys, Inc, which was the first company to deliver vulnerability management services as a SaaS-based web-service. From reviews, it seems like a competent tool with a low rate of false positives that is fairly easy to work with and keep the more ‘dangerous’ parts of vulnerability scanning out of the hands of users, but with the flexibility for expert users to do what they need. It would be up against other tools like Nessus, Retina, nCircle, NeXpose and Tenable. It can also handle internal scans using Qualys appliances which can communicate back the cloud-based system, which makes it very scalable. Qualys was founded in 1999. 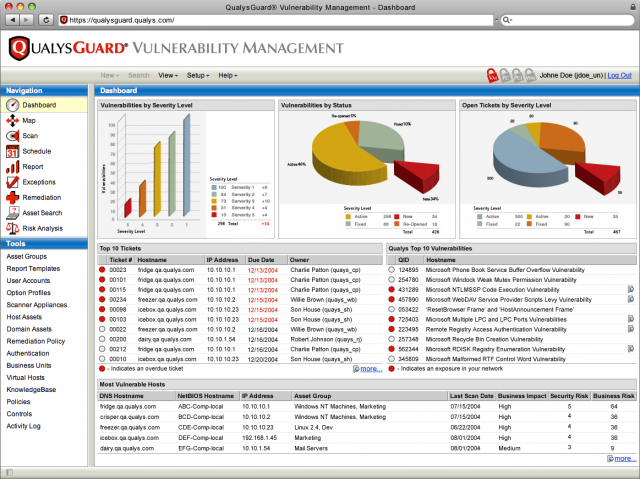 The company launched QualysGuard in December 2000, making Qualys one of the first entrants in the vulnerability management market. The QualysGuard Intranet Scanner was released in 2002 to automatically scan corporate LANs for vulnerabilities and search for an available patch. The following year, Qualys released FreeMap, a web-based tool for scanning, mapping and identifying possible security holes within networks connected to the Internet. In 2005, Qualys extended its QualysGuard product line. In 2008, Qualys introduced QualysGuard Policy Compliance, which extended the platform’s global scanning capabilities to collect IT compliance data across the organization and map this information into policies to document compliance for auditing purposes. QualysGuard pricing should start from around $2000 a year onwards, but no prices are made public and the latest information I could find was from 2014 ($2,495 per year, which provides scanning services for web applications on eight external IP addresses and PCI compliance reporting; $5,495 per year gets into the meat of the product giving subscribers scan coverage for 256 IPs and a virtual scanning appliance). You can read more on the Qualys website here, there is a free trial.